Steam the bananas, ginger and elaichi, till bananas are cooked, but bite like. Alternately cook with as little water as possible, so that there is no water left after the bananas are cooked. Leave to cool. When cool, mash the bananas; add the rest of the ingredients and mix well to form dough like consistency. Shape into small cylindrical rods and dust with the kootu ka atta. 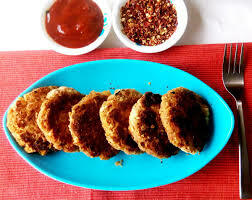 Heat a thin layer of ghee and fry the kebabs over medium heat, till brown on both sides. Vegetarian banana kebabs, flavored with ginger, coriander, green chili and cardamom seeds.